Armidale Regional Councillor Debra O’Brien, left, Armidale RSL Sub-Branch President Max Tavener, Northern Tablelands MP Adam Marshall and Mayor Simon Murray in Central Park today. ARMIDALE’S much-loved Central Park has been officially recognised for its significance as the newest addition to the NSW State Heritage Register, Northern Tablelands MP Adam Marshall announced today. Mr Marshall said Central Park had many remarkable features. “Central Park is of state heritage significance as an outstanding example in NSW of a substantially intact High Victorian formal town park,” he said. “While it played a key role at recent Armistice Day events in Armidale, the link between Central Park and commemorating war sacrifice stretches back more than 100 years. “The band rotunda was officially opened as a South African (Boer) War Memorial in March 1902. “The fountain was opened in 1922, dedicated as a memorial to the Great War, and is believed to be the only one of its type in NSW and potentially Australia. Aside from its incredible built heritage, Mr Marshall said the park was also significant for its plantings across its two hectares, some of which were established by Brother Francis Gatti, a capuchin lay brother attached to St Mary’s Catholic Cathedral nearby. 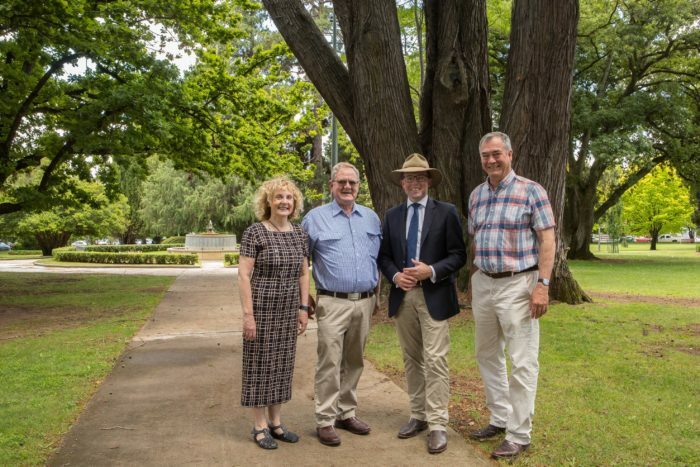 “Central Park has one of the finest collections of conifers in regional NSW and contains an unusual collection of nationally rare trees including the Lucombe Oak, Southern Live Oak and Douglas Fir,” Mr Marshall said. “Formally proclaimed in 1887, Central Park has long been an important part of the Armidale community and I am pleased its significance to NSW heritage has now been recognised.